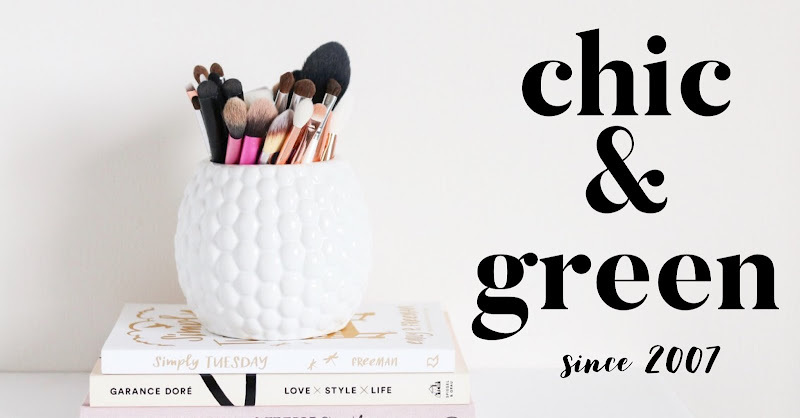 I'm Deanna, one of the new contributors of Chic and Green. Karley knows how much I love handmade, American products. When she asked me to cover the Handmade in America section of C&G, I replied, "heck yeah"! So here I am. I've been compiling a list of handmade Valentine's gifts available on Etsy to share with all of you. 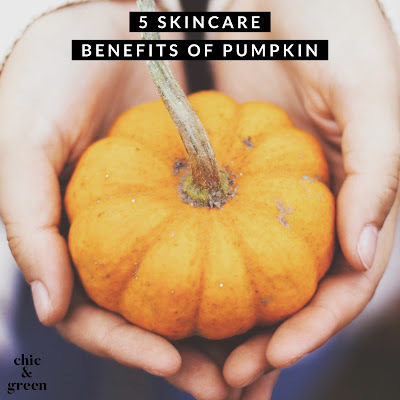 I'm so excited to share today's items. 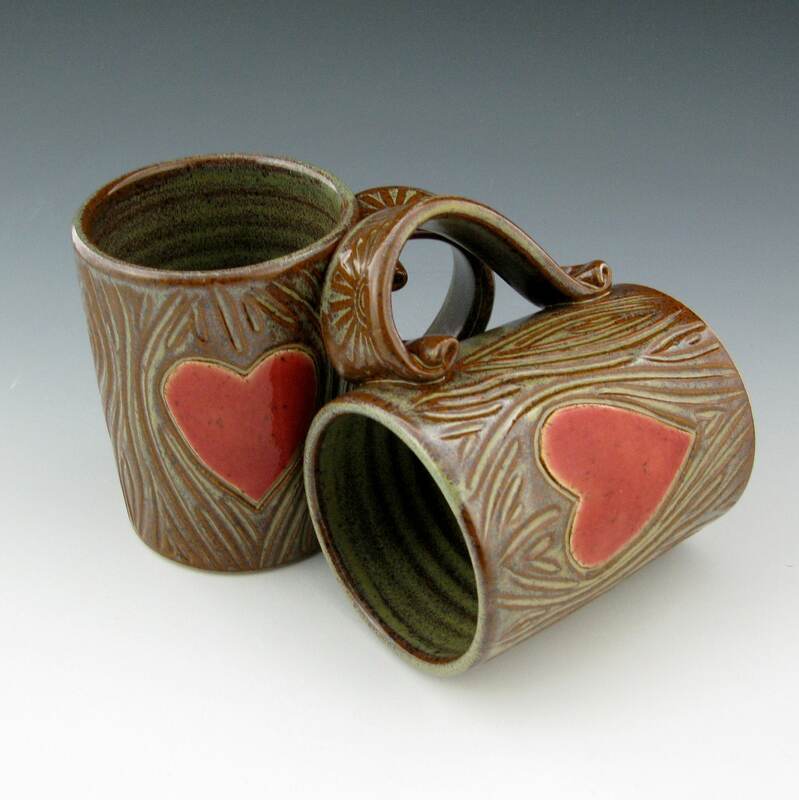 Without further ado, check out Twisted River Claywork's heart-themed mugs. The first set is my favorite. I bought them for my husband, Frank, and me this past Christmas. Admittedly they would make a perfect gift for you and your sweetheart for Valentine's Day but they would also be lovely for anniversaries, birthday, Christmas, wedding showers, weddings, Ground Hog Day...um, yeah, sorry. I overdid. I see that now. Sorry. I just really, REALLY love these. I adore custom items so I had to be different when I purchased our set. I had the mugs read, "D+F" on one mug and "F+D" on the other. As per the shop notice, to ensure Valentine's Day delivery orders must be made on or before January 20th. This next set is also made to order and are pretty darn cute as well! Even though they have a red heart on them they don't scream "VALENTINE'S DAY". Their cool faux bark look will appeal to guys and girls. 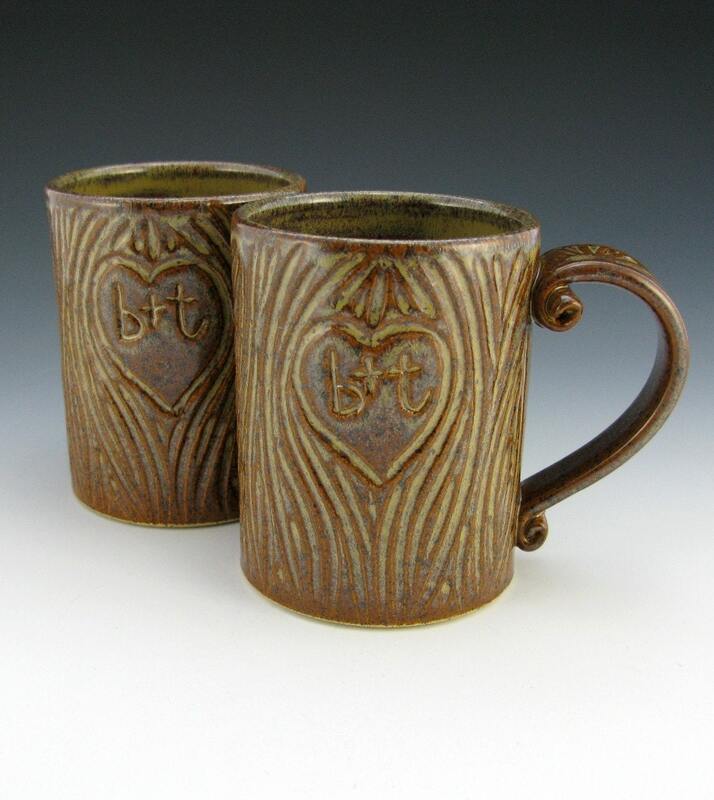 If you are interested in these sweet mug sets don't forget you only have until Friday, January 20th to get them for Valentine's Day. Tell Ron & Char hello for me! I have plenty more Valentine's Day gifts to share with you all in the coming days. Stay tuned!